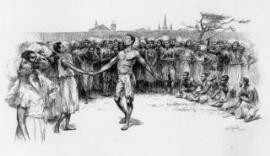 There's been a recent buzz about the ring shout dance that early African Americans and some contemporary descendants have done in the church. This dance, which was done in the fields and performed in front of the pulpit in churches, is being recognized as the foundation of Afro-American cultural expression. But, as always when there is no physical evidence that remains because it was destroyed through conquest, invasion, colonialism, etc. 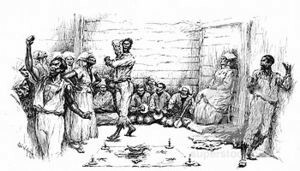 Scholars claim that the origin of our cultural practices are obscure, derived from some African dance and most likely from the interaction with some more "educated" group of people prior to slavery, usually Islamic West Africans. The same ridiculous claim was made about Ifa and the sacred writings done in the sand, but that's another story. This is the case with the ring shout. Since black people have called dancing in the church "shouting." It is believed that the word "shout" most likely comes from the Arabic word "shaw't" meaning circumambulation of the Kaaba. The claim is that since Muslim West Africans couldn't go to Mecca and walk around the sacred Kaaba site. These Africans created their own ritualistic way of performing the Hajj pilgrimage. This claim could hold water if it wasn't for the fact, that the ring shout dance was not only performed in the United States but also in Jamaica, Trinidad, Cuba, Puerto Rico and parts of Brazil. The whole concept of moving in a circular motion is African thinking and the African American influence comes from the Kongo-Angolan region. The people from the Kongo-Angolan region were the first indentured servants and slaves brought to the Americas. They were also the first to step foot on the shores of North America, which is why it is estimated that 1/3 of the African American population is of Kongo-Angolan descent. Yes, there were some Muslim West African influence brought to the Americas, which can be heard in blues music, but the ring shout dance is from Central Africa. The ring shout dance, which is a counter-clockwise march is based upon the movement of the sun that rises in the east (right), peaks in the north, sets in the west (left) and is reborn in the south. Is a ritualistic or shamanistic ritual performed around the dikenga, yowa or Kongo Cross cosmogram, which was the foundation of the Kongo Society. Anyone that is involved in Bantu-Kongo derived cultural practice will have in the deep recesses of their mind an image of the Kongo Cross, because it permeates every aspect of one's life. Since the Kongo-Angolan people were the first Africans that the Europeans encountered and enslaved. The Kongo-Angolan people were the most "documented" and "researched." 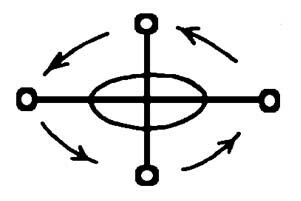 Proof of the use of this cosmogram can be found in Wyatt MacGaffey's Religion and Society in Central Africa and Robert F. Thompson's Flash of the Spirit and Four Moments of the Sun. Here one can find evidence that prior to the advent of the slave trade, the BaKongo (Kongo people) would march around the king's compound in the same counter-clockwise formation. A similar practice was performed at the death of respected individuals, which can be seen in the New Orleans Jazz funerals. 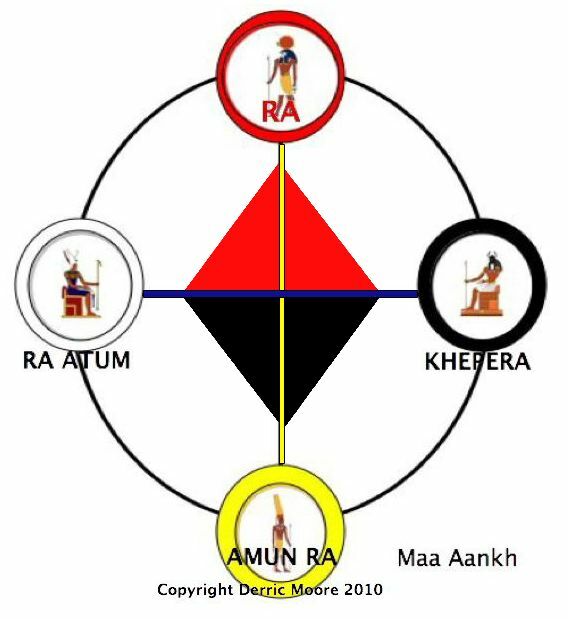 Amun Ra deals with REBIRTH! Amun Ra is not a god! Amun Ra is the Kamitic moment of the sun that corresponds to REBIRTH, that the Ba-Kongo called MUSONI. This is why our ancestors met clandestine in the cabins, fields, etc. and did the ring shout, because through the ecstatic dance they could RECREATE themselves in the foreign land they found themselves in. Through dance and trance one is able to communicate with the Spirit(s) and get fresh, new ideas and create success. This in my opinion is how Kamitic success was truly created. Nowadays, many devout church goers do the ring shout because times aren't that hard anymore. Slavery is over (or is it?) Folks got good jobs, some education and are livin' good. I ain't mad at you - SMILE :) - Keep doing you...but folks don't ring shout because they got new suits. Sistas ain't trying to sweat out their perms or get a sweat ring around their hats. Ain't nobody trying to get funky....but, when times get hard. Folks will march around the Walls of Jericho (metaphorically speaking - problems that they face) in the church, in the same counter-clockwise direction. We need to learn how to do the same. Write down on a sheet of paper an issue you are having or need some help in resolving. Also write down possible solutions to the problem. Next imagine a cross being on the floor and lay the sheet of paper in the center. Now put on some contemplative and rhythmic music that you are fond of preferably, blues, jazz or even some old gospel music. Make sure the cd is on repeat. State aloud the things in your life you are grateful for and ask for a solution to be revealed to you. Then dance in a counter-clockwise circle for a solution by focusing only on the question. Ignore all thoughts and ideas that come to mind and continue to restate in your mind your question that you need help resolving. Allow the Spirit through the music and dance to move you. Dance for at least nine minutes and then stop. Now pay attention because a solution to your request will come to you when you least expect it. The answer to your request may come while you are watching tv, driving to work, washing dishes, talking to a friend, etc. The solution may come to you in your dreams or as a premonition. You will know when it is from the Spirit because it will be like an inner knowing. When it comes, accept it, express your gratitude for it and act on it.